ExpertGPS Pro mapping software automatically converts Alaska 10 FIPS 5010 coordinates to and from any other coordinate format or datum, including UTM, lat/lon, and other Alaska state plane coordinate formats, in NAD27, NAD83, and WGS84. ExpertGPS Pro instantly converts GIS shapefiles and CAD DXF drawings in Alaska state plane coordinates to and from UTM or lat-long. Alaska 10 covers these Alaska counties: All of the Aleutian Island group lying west and south of Unimak Pass. 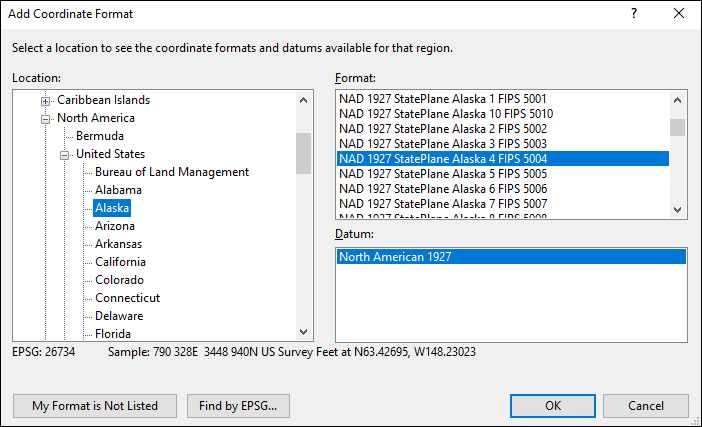 The first step in working with or converting Alaska 10 FIPS 5010 state plane coordinates in ExpertGPS is to add the appropriate coordinate format and datum for your project. On the Edit menu in ExpertGPS, click Preferences. Click on the My Coordinate Formats tab, and click the Add Format button. First, add the AK 10 SPCS, as described above. Enter your data in Alaska 10, paste it in from Excel, or import a shapefile or CAD drawing by clicking Import on the File menu. ExpertGPS Pro will convert your state plane coordinates and display them over a topo map or aerial photo of Alaska. Now add the UTM coordinate format and datum of your choice by returning to the Add Coordinate Format dialog. When you select UTM in the My Coordinate Formats list, all of your data will instantly be reprojected from Alaska state plane to UTM. You can now export the reprojected UTM data by clicking Export on the File menu, or copy and paste into a spreadsheet. Follow the instructions above, but instead of choosing UTM as your output format, choose one of ExpertGPS Pro's latitude and longitude formats. ExpertGPS can convert your Alaska 10 coordinates to lat-lon in decimal degrees, degrees and minutes (deg min.min), or degrees, minutes, and seconds (DMS). ExpertGPS runs on Windows 10, 8.1, and 7. Your GPS receiver can't display your location using the US state plane coordinate system, but you can use ExpertGPS Pro to send X,Y points or polyline data from your GIS or CAD software to your GPS receiver. Import or enter your data as described above. There's no need to select an output format like UTM or lat/long, unless you want ExpertGPS to display the same values that will be displayed on your GPS. Just click Send to GPS on the GPS menu. ExpertGPS will reproject the Eastings and Northings in your Alaska 10 coordinates into the native format used by your GPS receiver, and upload them directly to the GPS. Now you can view all of your GIS or CAD data in the field on any Garmin, Magellan, Lowrance, or Eagle GPS! Another option you have once you've imported GIS or CAD data in AK 10 SPCS into ExpertGPS is to convert it to KML or view it directly in Google Earth. To convert state plane to KML, simply click Export on the File menu, and select the Google Earth KML file type. If you just want to view your AK 10 SPCS data in Google Earth, simply press F7, the View in Google Earth command in ExpertGPS. Add the UTM coordinate format to ExpertGPS, and then import or enter your UTM data. To convert UTM to state plane, add and select the Alaska SPCS, as described above, and your UTM Northings and Eastings will be converted to state plane coordinates. Use the technique above to convert latitude and longitude data to Alaska Northings and Eastings. To convert Garmin, Magellan, or Lowrance GPS waypoints or tracks to Alaska 10 state plane is even easier - just click Receive from GPS. ExpertGPS Pro automatically reprojects your GPS data into whatever coordinate format you select: Alaska state plane, UTM, or lat/long. You can then export your reprojected data into a GIS in shapefile format, export a DXF for your CAD software, or copy and paste into Excel or a CSV file. Most handheld GPS receivers can't display Alaska state plane coordinates natively. But if you've got an older Magellan GPS receiver that allows you to set up a User Grid (check your GPS manual for compatibility), you can use the settings for the Alaska 10 Transverse Mercator projection listed below to trick your GPS into displaying Alaska coordinates in meters. On Magellan GPS receivers, go to the SETUP screen, and then click COORD SYSTEM, PRIMARY, USER GRID. If you want to use US Survey Feet instead of Meters, click UNITS TO METERS CONV and enter 0.30480061. Alaska 10 uses a Lambert Projection. ExpertGPS makes it easy to convert coordinates to and from lat/lon, UTM, Alaska 10, and other Alaska state plane coordinate formats. In addition to batch coordinate conversion, ExpertGPS Pro is the perfect tool for combining data from your handheld GPS receiver with your GIS and CAD layers. Visualize all of your data over USGS topo maps, aerial photos, and your own site maps. Download your free trial of ExpertGPS Pro now!